Most online content is in English, with very little actually being translated into other languages. This is saying something, since the two most spoken languages in the world are Mandarin and Spanish. English is the third most spoken language in the world, and funnily enough, the majority of online content is in English. With rising populations across the world, by 2020, the audience for your writing will be huge – all from different countries. If you have a local business, then perhaps, tailoring your website to other languages may not be necessary, but if you have a business which has potential to sell to anyone in the world – international SEO is an essential. You need to invest in getting your content translated because a couple years from now, a lot more business owners will be doing the same. You might even discover that a lot of your target audience is in other countries. Some of the most successful businesses have the most users in South America or Asia. In this guide, we’ll take a look at the fundamentals of International SEO: including, translating your website, doing research on which countries to target most and much more! For English speakers, you are targeting a certain set of keywords with your website. It might be “birthday cards for fathers” or “luxury blinds”. These keywords target the English language only, so the most traffic you can get is from the UK, possibly the US, Australia and Ireland. These countries provide small populations, in contrast with the populations in other countries, which far exceed the population of the UK, US and Australia put together. According to Bablic, did you know that 73% of people don’t search the web in English, but in their own language? So, with English, you are targeting at best, only 37% of your potential audience! Don’t let the other 73% of people go into the drain. All you have to do is find out which countries are actively searching for your keywords in other languages. For example, if you sell luxury blinds in the UK, who says you can’t sell them in Spain or France? There might be huge potential in those markets. You need to find out. To do this, simply translate your list of keywords into a popular language, like Spanish or French. Plug your translated keyword into the Google AdWords Keyword Planner. You can then find out the number of monthly searches, and if it’s worth your time. Use this as a metric: If there are more people searching in that language, than in English – it’s a must to target that language! Even if a couple thousand monthly searches is all there is, they still are all monthly potential customers, who could find your site. 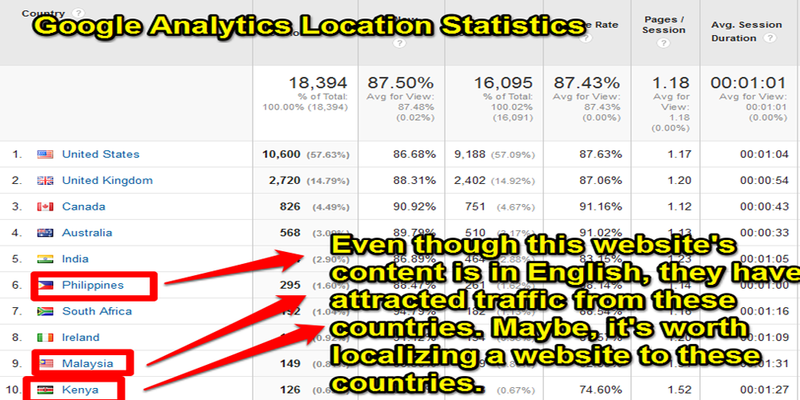 To find out other countries which may be worth targeting, you can check your website’s Google Analytics statistics. Some customers in other countries (Sweden, for example) often search in English, if they want more choice in the products on offer, rather than just search in their country’s language and get less choice. However, those few customers are very rare. According to Bablic, 56% of consumers say that browsing in their own language is more important than price. However, these customers might indicate which countries are highly interested in your products. To find out where there are high concentrations of interested customers, simply log-in to your Google Analytics account and click the Audience tab. Click on “Geo” and then “Location”. You can then see which countries visitors are located. Whilst the UK and US might have the highest concentrations, you should check the countries with other languages. Maybe Brazil or Portugal have a few hundred users coming to your website every year, so that means, that you should investigate Portuguese as an option for a language to translate your website into. This method is not definitive though, it just gives a rough idea of potential countries or locations you could target. One of the ways you can translate your website is through human translation. This ensures a professional and thorough translation which is very effective for bringing foreign customers to your website. Even if you don’t have the money for translating your website to many languages, even using human translation for one language is excellent. After you’ve done your research on which countries need targeting, you can see which language could bring the most gain. If you don’t want to get a country code top-level domain name for your website, you can allow your users to switch between languages, all on the same website. If you have translated your content, and want to submit it to your website, you should use a WordPress plugin called Polylang. You can add your translations to the plugin. Let’s say you want to translate your website into three other languages. The plugin works, so that for every page you create in WordPress, there are three other empty pages created (one for each language) where you can add the translated text into. Polylang will then combine all those translated pages together, and create a translated version of your website. When a Spanish customer arrives at your site, the website will display in Spanish. While human translation may not be an option for everyone, there is a free alternative. For example, you could invest in human translation (which is of higher quality than robotic translation) for one language or two, depending on where most of your potential customers are. However, if you just want a quick and fast way to provide translation for your website, Google Translate is an option. Its translations aren’t of a particularly high standard, though, so be warned. There is a better alternative available, called “Bablic” which we will take a look at in a moment. For a quick translation of your website, try Google Translate. Firstly, you need to install the Google Language Translator plugin. This is available for WordPress only. With this plugin, Google Translate will automatically translate your webpages. However, the translation is not automatically done, when a user arrives to your website. They still have to toggle between the languages. However, this plugin is still a great alternative to more technical, expensive options. Whilst human translation and Google Translate work well, there is a new alternative to the growing scene of localization. A startup called Bablic aims to help website owners translate their websites, in the click of a button with no programming experience or WordPress plugins whatsoever. Bablic are definitely pioneering the localization field and are making it increasingly easy to translate your website. All you have to do is choose between human translation or machine translation, and select the languages you want. A code will be generated, and you have to paste that code into the header of your website. Then, when someone arrives at your site, they can get the content translated to whatever language they are fluent in. It’s simple. Those that’ll translate their content will get a huge increase in traffic, customers and leads over anyone else. With new startups like Bablic making localization easier than ever, you should definitely start thinking about translating your content. You can extend your reach, broaden your customer base and increase sales of products or services. A whole new audience of potential customers might be in another country, looking for a product like yours, and you might not even know it!